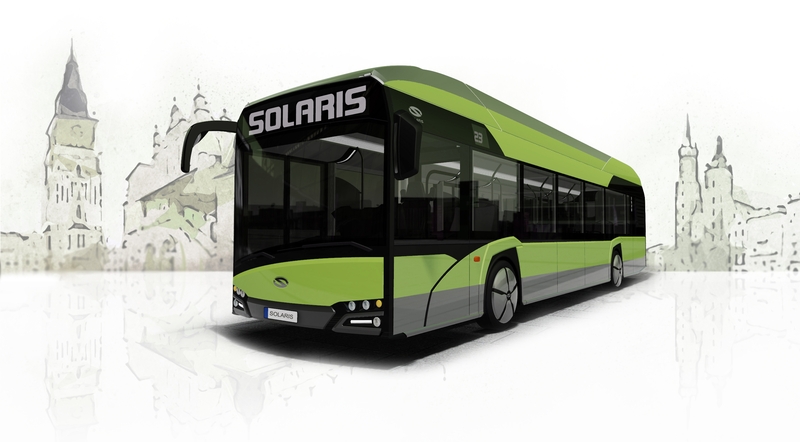 Solaris was awarded by the German industry magazine “Busplaner“ in the «Sustainability Award 2019» competition. The prize in the category “Concept Vehicle” was awarded to the Urbino 12 hydrogen – a hydrogen bus that will be celebrating its premiere in June, during the UITP Congress in Stockholm. The award ceremony took place on March 18 in Berlin. This is yet another distinction awarded by the editors of «Busplaner» to the Bolechowo-based manufacturer. Urbino 8.9 LE electric won it in the category «Innovation of the Year 2012», in 2014 it was received by Solaris Urbino 18.75 electric, and in 2017 the «Buspalner» prize was by received Solaris Urbino 12 electric in the «Public Transport» category for the contribution to the development of electromobility on the German market. «In response to the growing interest of the European market in emission-free public transport, Solaris has decided to introduce another eco-friendly bus – Urbino 12 hydrogen. We are pleased that our efforts to expand the portfolio of alternative vehicles have been appreciated «- stated Javier Calleja, CEO of Solaris Bus & Coach S.A.
Solaris is one of the first manufacturers of city buses in Europe to present a hydrogen bus, yet again proving itself to be a pioneer in the development of eco-friendly vehicles. Urbino 12 hydrogen will be completely emission-free – the only substance emitted while the bus is operating is steam. Energy needed to power the driveline of the bus will be obtained from hydrogen which will be processed in a fuel cell to electric power. Thanks to the technology used in the hydrogen buses, these will be able to cover a record-long distance (of all of the firm’s electric buses) on a single refuelling – over 350 km. The vehicle will be also fitted with low-capacity Solaris High Power traction battery of 29.2 kWh which is to support the fuel cell when the demand for energy is the highest. The battery will be charged with hydrogen energy. In addition, it will be possible to recharge it by means of a plug-in charging outlet (as in the case of standard electric buses). The drive unit, on the other hand, will constitute of an axle with integrated electric motors, with a peak power of 125 kW each.